Low-maintenance lawn care makes a lot of sense, as most flower gardeners would rather be tending their perennials. Lawns may be falling out of favor in some quarters, but there isn’t another ground cover that’s as kid, pet and sports-friendly as turf grass. And nothing sets off a lush flower garden as neatly as a green, well-cared-for lawn. With proper care, you can have a healthy lawn without spending a fortune on fertilizers and chemicals. Maintain only as much lawn as you need – replace some lawn area with a patio, path or deck. Remove grass on hard-to-mow slopes and plant ground cover perennials and shrubs there instead. On larger properties, reduce mowing with meadow plants or special low-maintenance turf grass mixes that require periodic mowing once a month or several times a season. For flower gardeners, one of the key things is keeping turf grass out of planting beds. To do this, edge beds with a small trench six inches deep and wide. Clean up edging with straight spade or garden edger once or twice during growing season as needed. To minimize edging work each year, consider permanent edging, such as a row of stone or brick pavers at least six inches wide set into ground so a mower can run over the edge. This is more costly than plastic edging, but it’s way more attractive. See garden edging tips for more options. 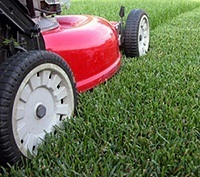 Mowing: Set your mower high so that it cuts just one third of the leaf blade at a time. Cutting too short weakens lawn grasses, making them susceptible to weed and pest infestation and drought stress. If you have a large lawn, cut mowing time by buying the widest mower you can afford. Keep your mower blades sharp and don’t mow when grass is wet. Grass clippings: Keep them on the lawn if possible. They return moisture and nutrients to turf grass, so don’t rake them up unless you really need to. Clippings can generate up to 25 percent of your lawn’s fertilizer needs as they decompose. Get a mulching mower that cuts grass clippings fine for quick decomposition. Watering: Giving your lawn water during dry spells helps to avoid drought stress that makes turf vulnerable to dandelions and other weeds, pests and diseases. Water once a week, but thoroughly, allowing one inch of water to accumulate. You can measure this put putting a rain gauge or tuna can on the lawn before you turn on the sprinkler. Fertilizer: For low-maintenance lawn care, avoid over-fertilizing. Recent research into low maintenance lawn care recommends only one or two applications a year of a slow-release, high nitrogen lawn fertilizer. The key lawn fertilizer application: The right timing is in late fall when grass has stopped growing, but is still green — around Halloween or just after in warmer parts of the country, and several weeks earlier in colder regions. At that time grass is still photosynthesizing but not making active growth. The late fertilizing encourages the sugars produced to be stored in the roots and the crown, increasing winter hardiness and promoting quick greening in spring. An optional fertilizing in late August or early September, when the temperatures start to cool, gives turf a boost after the heat and dryness of mid-summer. Fall raking: Rake leaves off your lawn each week through the fall instead of leaving the job until all the leaves have fallen. In fall lawn grass still needs sunlight as it is creating sugars to store in the root system for good growth next spring. Leaving the leaves on top of the lawn for weeks at a time will smother the grass and weaken it. Dethatching: Thatch is not caused by leaving clippings on the grass after you mow. It’s actually brown plant material that can build up between the green blades and the roots. Some thatch is protective, but too much can keep moisture, air and nutrients from penetrating the soil at the roots. The best time to dethatch is every couple of years in the late summer or fall. You can use a rake or a lawn dethatcher.